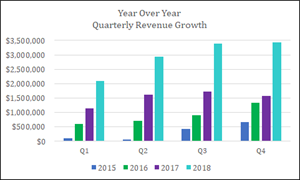 NORWOOD, April 17, 2019 (GLOBE NEWSWIRE) -- – MariMed Inc. (OTCQB: MRMD) one of the largest multi-state cannabis and hemp operators in the U.S., today announced 2018 4th Quarter and Full Year results. Continued Strong Revenue Growth - In the fourth quarter ended December 31, 2018, revenues grew 118% to $3.44 million, compared to $1.58 million in 2017. Technology and New Products - In December 2018, the Company made a strategic investment in Iconic Ventures Inc. based upon their new product DabTabs™ and other technology under development. MariMed secured the exclusive distribution rights in multiple states. A photo accompanying this announcement is available at "Quarterly Revenue Growth"
This release contains certain forward-looking statements and information relating to MariMed Inc. that is based on the beliefs of MariMed Inc.’s management, as well as assumptions made by and information currently available to the Company. Such statements reflect the current views of the Company with respect to future events including estimates and projections about its business based on certain assumptions of its management, including those described in this Release. These statements are not guarantees of future performance and involve risk and uncertainties that are difficult to predict, including, among other factors, changes in demand for the Company's services and products, changes in the law and its enforcement and changes in the economic environment. Additional risk factors are included in the Company's public filings with the SEC. Should one or more of these underlying assumptions prove incorrect, actual results may vary materially from those described herein as "hoped," "anticipated," "believed," "planned, "estimated," "preparing," "potential," "expected," “looks” or words of a similar nature. The Company does not intend to update these forward-looking statements. None of the content of any of the websites referred to herein (even if a link is provided for your convenience) is incorporated into this release and the Company assumes no responsibility for any of such content.